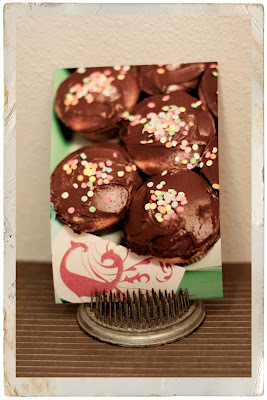 today's friday creative is a super sweet idea from my wonderful friend tammy t! we had an awesome girls trip last weekend to the farm chicks antique show and we found lots of super cute things to turn into photo holders (because if you haven't noticed yet, i'm bored with frames). so here's the first of many ideas from the show, floral frog photo holders! -mat/back photo on cardstock if desired (if your print is flimsy, you might want to back it with cardstock to help it stand up in the frog). p.s. thanks again to the wonderful miss sara & her adorable little guy zach, who made me those sweet cupcakes!